Best known for excellent music production software like Amplitube and SampleTank, IK Multimedia has been building their line-up of affordable audio hardware similar to Apogee’s entry-level offerings. 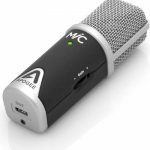 Like the Apogee MiC 96k, iRig Mic Studio may be small in stature but it’s a serious tool aimed at musicians on the go and podcasters. It can’t reach sample rates of 96kHz like the Apogee, however it’s priced lower and can record 24-bit up to 48kHz. Many professional recording studios don’t use sample rates any higher than 48kHz, so this is plenty for the budding musician or podcaster recording at home. 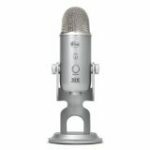 At one time 24-bit was only available in the priciest USB mics to it’s encouraging to see technology advanced to the point IK Multimedia can offer it at such a low price point. IK Multimedia is emphasing it’s 133dB SPL rating. This means you can record anything from a whispering voice to cranked guitar amps and snare drums. Frequency response is rated at 20Hz to 20kHz. 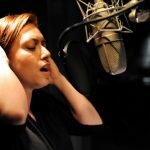 Sound quality is good with clear slightly exaggerated top-end, which makes it good for recording vocals. 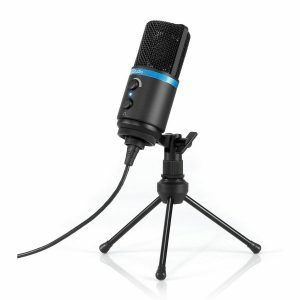 The mic’s design is simple and sleek. On the front there are two knobs: one for recording gain and the other for headphone monitoring volume. There is a 3.5mm/1/8” jack on the back for connecting headphones. I was skeptical about the claims of it having a “large-diaphragm capsule” inside due to the size of the mic. It turns out capsules classified as large-diaphragm range from about 32mm to 34mm (1.26” to 1.34”). The capsule inside the iRig Mic Studio is 1”. So yes, the claim is slightly exaggerated. Still, it’s amazing they are able to fit a decent sized capsule like this in such a small housing. It can be connected to a huge array of devices: iPhone, iPad, iPod touch, Mac, PC and Android. The cables needed to do so are included too: Lightning, Micro-USB OTG and USB cables (30-pin cable is not included). 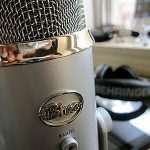 The iRig Mic Studio is a phenomenal bargain. 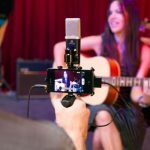 For $50 more than the Yeti you get the ability to make 24-bit studio grade recordings and with a huge amount of connective options for use with iPhone, iPad, iPod touch, Mac, PC and Android. Bidirectional and omnidirectional recording modes are not present which can be useful for interviews or group recordings. However for most applications this feature won’t be missed much.